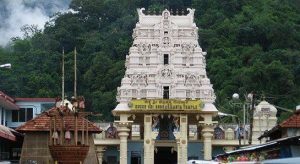 SHRI KSHETRA KUKKE SUBRAMANYA - Ballalraya vigrah g, sati, SHRI KSHETRA KUKKE SUBRAMANYA - Ballalraya vigrah - Shiva Maha Purana, Vishnu Purana, garuda purana, bhavishya purana, skanda purana. This is a statue of king Ballal. Hoysal Ballal kings ruled in the elecenth century. Later Ikkeri dynast began to rule in this district. But in small districts Ballal kings ruled. Subrahmanya was once the capital of one such Ballal chieftain. There is an interesting story about the instal­lation of this vigrah. It is believed that the vedvyas samputa in ossession of subrahmanya matt is unbreakable. But out of curiosity Ballal , chieftain tried to break the vedavya samputal by making an elephant trample upon it. Soon he felt a burning sensation and was horrified. So he prayed to lord Subrhamanaya. Then he ordered to install a statue before the entrance.